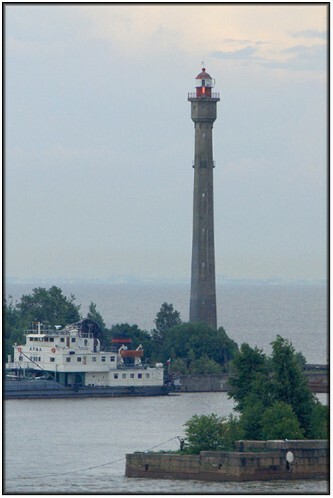 Very tall range lights appear to be something of a feature of the Russian pharology scene, and this one's another giant at 177 feet in height. It is located on the eastern side of the naval base at Kronshtadt, home of the Russian Baltic Fleet - or such units of it as have not yet entirely rusted away! Much of the base itself looks semi (or completely) derelict, even the granite piers and sea walls giving the impression that they are slowly crumbling into the sea and many of the ships in harbour gave the impression that their chances of ever going to sea again were only slightly better than zero.